Thievery – A Perfectly Reasonable Way to Get Food /Hawks Aloft Inc. Routine behavior for one of the smallest raptors on the planet! 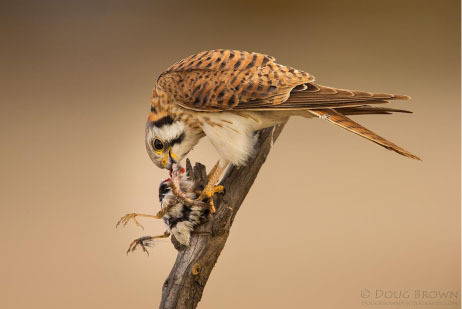 Just last week, I read about a European Kestrel attacking a much larger Barn Owl in an attempt to snare a free meal. 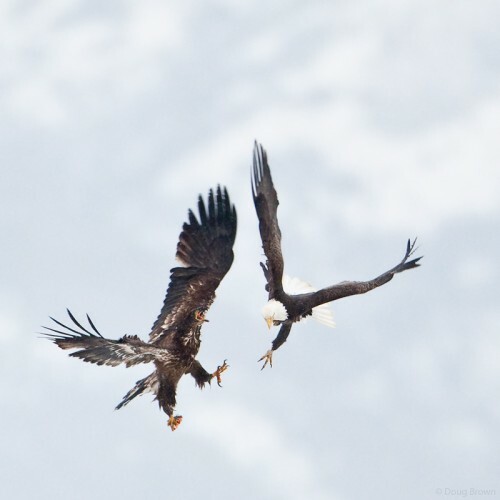 The story includes some amazing action shots of the two birds with locked talons. Ultimately, the Barn Owl was able to keep its respectably obtained meal. 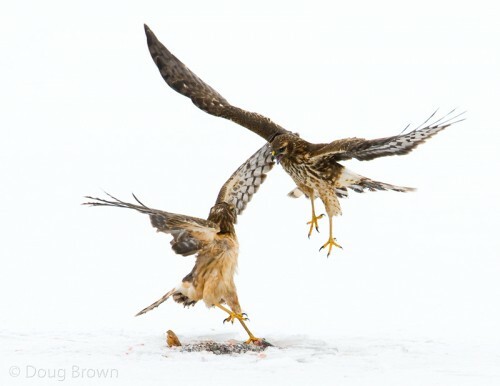 Northern Harriers Fight over a Meal. Image by Doug Brown. We are taught that raptors catch and kill their prey. However, no raptor is above scavenging a free meal – often the reason why so many hawks, falcons and owls are struck by vehicles as they scavenge for roadkill. The Northerrn Harrier is a raptor that generally eats small mammals, with a unique hunting style of flying low over fields and marshes with tall grasses, listening as well as looking for the small prey items. They are not known to catch fish! Above, the juvenile has obviously found a dead fish, a great prize, and the adult female clearly intends to steal it from him/her. Adult and Juvenile Bald Eagles Squabble. image by Doug Brown. Even among our national symbol, the Bald Eagle, thievery is common. Here, an adult attacks a youngster that has a chunk of fish in his foot. It is rare, however, to capture images of this behavior in action. We thank Doug Brown and our many photographers who contribute their work to us!